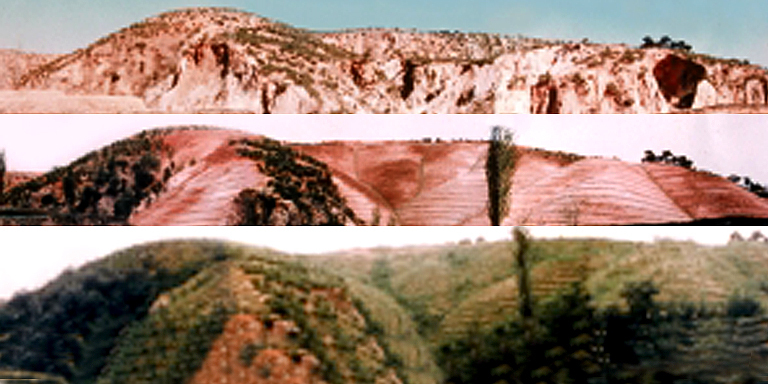 A photo shows “before and after” images of a mountainside which was previously barren. Photo credit: KDevelopedia. Until the late 1950s, 58% of the mountains in the Republic of Korea were bald, while 11% of the land was barren like a desert. From the early 1960s, the government established the forest laws and reformed the forest administrative organizations, while making comprehensive reclamation policies. Also, through the strict execution of the related policies and the follow-up management of the planting sites, every denuded land was successfully recovered within 40 years. Such a success was possible by the creation of incomes and incentives for the village farmers through the forest reclamation projects, and voluntary participation of the farmers through the Saemaul (New Village) Movement in addition to favorable economic and social conditions. The government played the main role in forest reclamation. After the liberation of the country in 1945, the Rhee Syng Man regime (1948-1960) failed to establish neither a strong government nor enough budget for reforestation. Also, due to the Korean War, social chaos was quite serious, making it impossible to properly carry out the forest reclamation policy. In 1961, Park Chung Hee regime enacted forest-related laws and organized the administrative institutions one by one, while stabilizing the society. The Park Chung Hee regime (1961-1979) established various laws related to forest reclamation which had not been enacted by the Rhee Syng Man regime. The eleven related laws enacted from 1961 to 1972 can be found at KDevelopedia where these laws have been discussed in details. Among such laws and acts, the Forest Law in 1961 is the most important law which became the basis for the current forest law. Based on the law, the planting and the management of the national and private forests became institutionalized. Also, specific measures to prohibit destruction of the forest were provided. In particular, by making the Village Forestry Cooperative a public corporation, it was possible to promote a high level of participation of residents of the farm villages in the reforestation project. Also, with the Erosion Control Act, denuded forest land was reclaimed. Furthermore, Slash-and-Burn Farming Regulation Act made it possible to get rid of all the slash-and-burn fields, while a “greenbelt" system was adopted to protect the forest around cities. After 1961, the government attempted to recover ruined forests by establishing various forest-related laws as shown above. However, it was difficult to stop immediately practice of collecting the fuelwood (including the collection of the leaf litter) and illegal timber harvesting which had been carried out for hundreds of years. Therefore, the government realized the limit of the simple enactment of related laws and recognized the necessity for reorganization of the forest administrative institution. The government became aware of the urgency of the forest reclamation. Therefore, in January 1967, it expanded and reorganized the Forest Bureau as the Forest Service. With the new establishment of the Forest Service, it was possible to put fuelwood forest establishment project, erosion control project, and reforestation project on the right track. After contemplation of the efficiency of forest reclamation, the government transferred the Forest Service from the Ministry of Agriculture to the Ministry of Home Affairs in 1973. The Forest Service under the Ministry of Home Affairs was directly connected to local government (provinces, counties, cities, townships) under the same Ministry and was helped by the financial support of the local government. Also, it was possible to make the most of the farmers through the Saemaul (New Village) Movement which was initiated by the same Ministry and was welcomed by the farmers with much enthusiasm at that time. In addition, it was possible to reinforce protection of forest by mobilizing the police force under the same Ministry. Such government’s intention was right judgment, and the forest reclamation project was chosen as the national project with great momentum. When the Forest Service was transferred to the Ministry of Home Affairs in 1973, the government expanded Forest Department of the provincial unit to Forest Bureau and newly established three departments (in charge of forest management, tree planting, and planting stock raising). Also, Forest Section in cities and counties was expanded as the Forest Department (Silviculture Section and Forest Protection Section), giving forest officials many opportunities for promotion. After the transfer to the Ministry of Home Affairs in 1973, Forest Service made comprehensive long-term nationwide forest reclamation plan. The plan included not only policies related to tree planting, erosion control, and forest protection, but also those related to alternative energy supplies, frugal use of timber and promotion of food production in forests. The project included reforestation of 1 million hectares (ha) using 2.1 billion trees in 10 years, tending care of 3.8 million ha, and erosion control work on 84,000 ha. The three basic directions of the plan were as follows. National tree planting. Every citizen plants trees year round with the spirit of the Saemaul (New Village) Movement through villages, working places, homes, organizations, institutions, and schools. The government also made a 1-day national holiday to mobilize even elementary school students to participate in the tree planting. Economic planting. The tree planting and preservation of the forest are to be directly linked to the increase in the nation’s income, while a new economic zone is to be established in the mountain area. Fast tree planting. The 6.67 million ha of mountains are to be completely covered with trees resulting in the green revolution. In order to complete the forest reclamation early, many fast-growing trees are to be planted. The government introduced foreign tree species and developed new species as well. One of the species mentioned was chestnut trees. Also, loggers and companies consuming much timber should plant trees, while fuelwood forests should be established by each village to produce fuels for their own. Furthermore, erosion control project is carried out to recover large ruined regions first, and planted-tree inspection system is chosen in order to inspect in autumn the survival rate of the trees planted in spring. The goal of the first Ten-Year Forest Rehabilitation Plan was accomplished within only 6 years. The Forest Service established the Second Ten-Year plan in 1979. The plan was adjusted twice to plant 2 billion trees in 1 million ha and for the tending care of 150,000 ha of natural forests. The basic directions of the second plan included complete greening of unstocked area and the areas with urgent erosion control, formation of the large-scale commercial forest complex, development and planting of native woody species, establishment of the plan for land use, exploration of foreign forest resources, development of the forestry technology, timely supply and export of forest products and promotion of public benefits of the forest. The goal of the second Ten-Year Forest Rehabilitation Plan was accomplished within only 9 years. The Forest Service changed the title of the plan to Forest Basic Planning (1988-1997) in 1988, establishing planting plan for 320,000 ha in 10 years. The new plan focused on the establishment of the large-sized commercial forest, and promotion of income sources for mountain village, public health, environmental function of forest, and preservation of biodiversity. The fourth Forest Basic Planning (1998-2007), emphasized the creation of new jobs through tending care of forests. In order to mitigate the IMF financial crisis which started in 1998, a large-scale public labor project was expanded for the planting of 200,000 ha, thinning of 730,000 ha, and tending care of 930,000 ha in 10 years. The fifth Forest Basic Planning (2008-2017) included a planting plan for 240,000 ha in 10 years. By continuously establishing commercial forest complex, domestic wood supply would be increased and health of forest ecosystem and green spaces for amenity be enhanced. In the forest reclamation process, people’s cooperative spirit and voluntary participation were as important as the role played by the government. It is impossible to carry out a large-sized tree planting project in the steep mountainous region of poor transportation without the cooperation and participation of the neighboring farmers. The cooperation of the people was essential for the successful forest reclamation in the Republic of Korea. The Forestry Cooperative originated from the Durae spirit shown by our ancestors for farming a long time ago and the Village Pine Cooperative which protected pine trees based on the village unit. After the Korean War, the government enacted the Temporary Forest Protection Act in 1951 in order to hasten the protection of the forest. By giving the right of a public corporation to the Village Forestry Cooperative, the Village Forestry Cooperative was created. Later, through the establishment of the Forest Law, the Forestry Cooperative and the Forestry Cooperation Association were newly founded and recognized as special corporations. The Village Forestry Cooperative was composed of forest landowner and residents of the village, having a duty of protecting forest around the village. According to the articles of association, the following projects were carried out: control of the illegal cutting and destructive logging, accusation of those violating the rules, prevention and firefighting of forest fires, relief of forest diseases and pests, self-supply of forest fuelwood, participation in the erosion control project, stock raising, creation of income based on tree planting and cultivation, execution of trust projects and division of profits based on profit sharing forest agreement. After 1973, every Forestry Cooperative in the country exclusively carried out the fuelwood forest establishment project on behalf of the government. The government assigned the project to Forestry Cooperative in order to enable farmers to supply necessary fuelwood by themselves. Also, stock raising was supported in the form of the Saemaul Nursery. At that time, there was an extreme lack of land that could be used to establish fuelwood forest. Thus, abandoned the empty land, riverbed and leftover piece of land was used first. When establishing fuelwood forest on private forest or national forest, the Village Forestry Cooperative divided the profits with the forest landowner by "the profit share contract" with a ratio of 9:1 based on the Forest Law. The Saemaul (New Village) Movement was a mind-changing movement and a public enlightenment movement for creation of better village life, based on such three mottos as diligence, self-reliance, and cooperation. Through such a process, an agricultural and living environment of a farming village were improved. Also, it was an income improvement movement which created profits of a farming village by making a connection between various kinds of Saemaul Movement and the income of the village. The five parts of the Saemaul Movement were the projects for the improvement of the living environment, agricultural environment, village environment, convenience facilities, and for income-boosting. Among such projects, the income-boosting project related to the forest reclamation included the Saemaul Nursery, while the project for improvement of village environment included Saemaul afforestation and Saemaul erosion control project. According to the statistics given by the Ministry of Home Affairs, the Saemaul afforestation was performed in 470,000 ha, which was 43% of the entire national afforestation between 1973 and 1978. Also, "My Village Planting Movement" focused on the process of planting trees on leftover pieces of land or the hills having no trees. Such a movement belongs to an exemplary case in which the village residents voluntarily planted trees. Among the erosion control projects which were carried out between 1973 and 1975 for 22,976 ha on a national scale, 70.7% of them were executed as the Saemaul erosion control project. Also, 19.5% of the erosion control projects, which were carried out between 1981 and 1987 for 25,061 ha, were executed as the Saemaul erosion control project. The Saemaul Movement dramatically increased the level of income in a farming village, making it possible for the village to use coal instead of the fuelwood. As a result, it was no longer necessary for farmers to collect the fuelwood from a mountain, which made mountain soil more fertile. Through such a process, the forest became thickly wooded and the country became more beautiful with no danger of any landslides or flood, which led to a good crop harvest. The farmers were able to see the reward of the Saemaul (New Village) Movement directly with their own eyes. Also, the national tree planting movement and the Saemaul Movement for cities and working places are evaluated to have made contributions to the reforestation. The government established a strategy to activate the Saemaul Movement by increasing farmer’s income through tree nursery. A Saemaul nursery was operated by the members of the Village Forestry Cooperative. The government lent all the financial funds required for operation of the initial tree nursery. By using such funds, Village Forestry Cooperative purchased seeds, fertilizers, and instruments and paid for the rent of the land. Then the government guaranteed profits of the Village Forestry Cooperative by purchasing all the produced seedlings at the market price. The Village Forestry Cooperative paid 50% of the profits to the members as wages, while donating the other 50% as a village fund. As a result, the Community Credit Cooperative (CCC) was born. The Saemaul Nursery played a big role during the period of the first Ten-Year Forest Rehabilitation Plan (1973-1978), taking 34.8% of the 2.7 billion seedling production on a national scale. During the same period, the Saemaul Nursery had profits of 12.3 billion won in total, which made the basis of the annual profit of 370,000 won for each village. Not all the profits gained by the stock raising of the village were shared with the participants. Some were saved as funds for the follow-up projects of the village. For example, 50% of the profits of 860 million won in 1973 were saved as the “compound income fund” in order to provide a foundation for joint investment to create another source of profit. Such an accumulation of profits was quite helpful for the establishment of the Saemaul funds. Government communicated with the public in order to induce their active participation. Also, by training the public, the government promoted not only the importance and urgency of the forest reclamation but also the benefits of the forest, inspiring the forest conservation spirit. Meanwhile, the private sector was as successful as the government in inducing the public enlightenment and interest. Among the NGOs, there are many organizations directly involved in the preservation of forest and promotion of forest culture. Currently, there are 170 corporations, foundations and special corporations registered in the Forest Service. Such organizations like the Forest for Life National Movement, North East Asian Forest Forum, Forest for Peace, Future Forest, Society for Forests and Culture and Korean Forest Interpreters’ Association lead the love for mountains, the protection of the forest, dissemination of forest culture, and public promotion and education. As national economic and educational levels increase and the forest becomes thicker, protection of the forest and the public promotion by the NGOs seem to become more active. In the Republic of Korea, it was possible to successfully perform the forest reclamation within a short period with the help of the cooperative spirit among the residents of a village (the Durae spirit) which had been traditionally handed down, and with the help of high level of education fever based on the Confucian society. Based on the Korean experience, it is possible to apply the following matters to developing countries. Since each country has its own unique culture, society, religion and national emotion which are different from those of others, it is impossible to apply the forest policies which have been successful in the Republic of Korea to other developing countries. However, for each country, such tasks as reexamination of the government organizations related to the forest reclamation, establishment of the comprehensive forest reclamation policies based on the residents’ participation, preferential selection of the projects which are urgent on the site, method to establish the fuelwood forest which is suitable for the site, forest reclamation using the natural vegetation, and policy plan to mobilize the farmers’ manpower may be selected with the advice given by international experts before confirming their own projects. The government’s Forest Experiment Station develops the technologies for stock raising, restoration of the vegetation, tree planting, erosion control and preservation of the soil, which can be applied to the forest reclamation while introducing excellent foreign tree species or developing new species. The Forest Training Center provides the training of forest officials for the technologies related to the forest reclamation. The forest reclamation is a long-term project which makes it hard to have a short-term benefit or income. Therefore, in order to promote farmers to participate in the project, the government must provide rewards (incentives) for mobilization of farmers. Such incentive becomes a catalyst to help the farmers to actively participate in the project. It is the most appropriate to make a connection to income. It is necessary to develop such projects as fuelwood forest establishment project which provides self-sufficiency, stock raising nursery project which creates income, subcontracted erosion control project, and reforestation project which makes it possible to produce forest products in the early stage (for example the plantation of the fast-growing trees and the nut trees). The Official Development Assistance (ODA) project provides the free assistance and the technical support given by advanced countries to their developing counterparts. By using it actively, it is possible to select a system in a way that is suitable for one’s own conditions and based on the successful case of an advanced country. The Korea International Cooperation Agency and the Asian Forest Cooperation Organization have been established for these purposes. k-Learn. Successful Reforestation in South Korea. His research interests include tree physiology, tree health biology, tree maintenance, and history of Korean reforestation. He has co-authored Introduction to Forest Science and Abiotic Disorders of Landscape Trees in Korea and contributed to a number of publications. He earned his bachelor of science in Forestry from the Seoul National University, master's in tree physiology from the University of Wisconsin, and Ph.D. in tree physiology from the University of Florida. Research interests of Yeo Chang Youn include the economics of ecosystem services, governance of forest commons, forest policy history, and economics of climate change mitigation. His work has been published in reports of research institutes, such as IPBES, Korea Forest Service, and in books and scientific journals. He has worked for Forest Research Institute South Korea, Seoul National University, University of Washington and ITTO. He completed his BA in forestry from Seoul National University, Masters in forestry and Ph.D. in forest economics at Seoul National University, University of Washington.